By June most recent high school graduates know what college they are going to, but many of them may still not know how they are going to pay for it. We’ve heard the stats that the average debt students have upon graduation has skyrocketed to $35,200, according to a recent Fidelity survey, and that the costs of attending college increase 6% each year. College is still a great investment for most students, especially with some planning ahead of time to help keep debt to a minimum. It’s still true that those with a bachelor’s degree will earn $1 Million more over their lifetime than those who only complete high school. 1. Create a College Savings Plan – Just like savings for retirement, it’s good to save early and often. There are many ways out there to help you save, from a 529 account to Savings Bonds. Tip to find extra money to save: If you can save an extra $300 a year ($25 a month at 5% interest, compounded monthly for 18 years) you will have an extra $8,766.43 to put towards tuition bills. 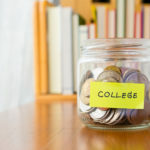 Haven’t created a college savings plan yet? Pledge to Save with America Saves and you can set your savings goal and create a plan to reach it. You can even sign up for text message tips and reminders to help you reach your goal of saving for college. 2. Shop Around For Schools and Free Money – The Consumer Financial Protection Bureau created a tool to compare the costs of different colleges. Their tool will let you compare financial aid offers so you can see how all those numbers impact your payments down the road. Apply for as many scholarships as you can. $500 here and $1,000 there can go a long way to helping pay for college. Many students also stop looking for scholarships once they enter college, but keep applying each year. Need some inspiration? Check out the article “How I won $100,000+ in college scholarships” by Ramit Sethi. 3. Find Ways to Reduce Spending (or Earn Money) While in College – Live at Home – Living on campus can cost anywhere from $7,500 to $9,000 per year. Consider living at home during college (if you can) and you can save nearly $40,000. You can still get a full college experience by joining clubs and being active on campus. Get a Part-Time Job – Look for a job on campus or a paid internship to supplement your income and pay for expenses like food, books, and incidentals while in college. The more you can pay upfront the less your monthly loan payments will be when you graduate. Need more ways to save? We’ve got a list of 54 ways to save here.